At a recent meeting of the APPG (All-Party Parliamentary Group) on Third World Solidarity Obang Metho, Ethiopian human rights activist and director of Solidarity Movement for a New Ethiopia, told parliamentarians, journalists and other attendees that the British government is propping up the corrupt regime in Ethiopia. In a passionate and emotional speech, Metho said that the government of Ethiopia was not democratically elected by the people and denies its citizens basic human rights and freedom of speech. “Know this about the Ethiopian government: who they are and what they say are, are totally opposite. The government in Ethiopia is 95% controlled by one ethnic group, he added. The event, which sparked huge controversy in the media, had an intense and emotional atmosphere as academics, parliamentarians and eyewitnesses shared their opinions. Portuguese MEP Ana Gomes, who was the head of the EU election observation mission to Ethiopia in 2005, supported Metho’s view. She was vehement and bold in her condemnation of the Ethiopian government and the 2005 elections, which she claimed were anything but free and fair. She highlighted the dilemma that she faced at the time: the knowledge that publicly declaring that the elections were corrupt would cause anarchy and bloodshed, and risked tearing apart the second most populist country in Africa. The MEP expressed her regret at having been too diplomatic about the situation at the time and continued her speech unafraid. She claimed that the Ethiopian government are selling the people’s land and even children to pay for weapons, at which point she received applause from the audience. The 2010 May elections in Ethiopia will be another farce, Gomes warned. She said that the onus is on the media to draw attention to what is happening and shame the government into bringing change. Councillor Mushtaq Lasharie, who chaired the event and is well known for his hard work on third world solidarity, pointed out that terrorism receives a hugely disproportionate amount of publicity compared to global poverty. 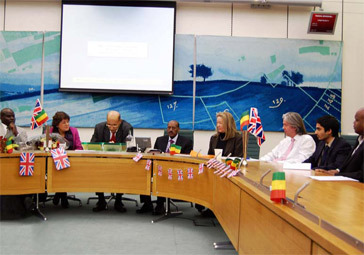 Members of the audience heckled and interrupted the speakers, unable to contain their anger and emotion over the current situation in Ethiopia. Saundra Satterlee, a former Financial Times journalist who lived in Etophia, provided the relevant background. She highlighted that Ethiopia is the oldest independent country in Africa that has never been colonialised. It also has a very mixed record: its economy grew 7% this year, making it the fastest growing economy in Africa, however, it also has one of the lowest per capita incomes in Africa, if not the world. Press release provided by London City PR. Full-service PR agency.